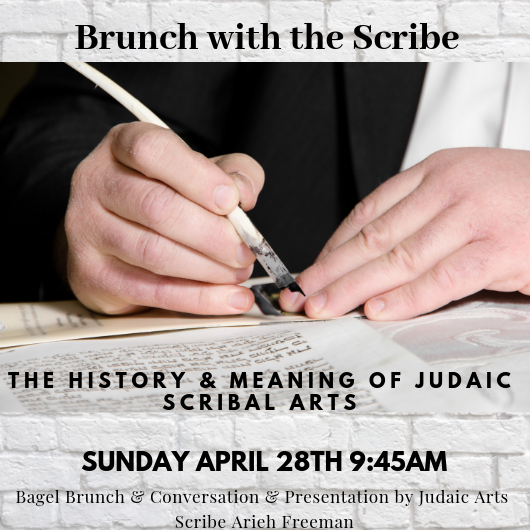 The Chabad Center of Sudbury invites you to join us for a Brunch & Conversation with Arieh Freeman who is certified Sofer, Judaic Arts Scribe. Munch on fresh Bagels and Lox and watch a demonstration of Jewish Scribal Arts and hear a fascinating presentation on the history, meaning and relevance of Judaic Scribal Arts. For thousands of years, Judaism's core book of the Torah has been passed down from one generation to the next through the Torah Scrolls which are hand written on special parchment. Likewise the Mezuzah Scrolls that adorn our doors, the Tefillin that we lay and many other important things use this ancient yet relevant form of scribal writing. What lays behind this and why do we not move over to printed versions? Why do some letters have Crowns on them? Why does it matter if some letters are missing or cracked? What interesting historical documents have been found with these writings? And what ideas and lessons can we understand that could be meaningful to us in the 21st century.